Lisa, it’s your birthday. Happy birthday, Lisa. Alex sings a version of this song to me every year. While most people think of the standard happy birthday song, this is the song we think of for birthdays. We celebrated my birthday yesterday! I spent a day at the spa followed by a delicious dinner with the husband. We ended the night with cake, donuts, and the Stark Raving Dad episode of The Simpsons (season 3, episode 1). And tonight the celebrations continue. We’re going to a Coconut Club event with some friends to sip on tiki drinks all night! Alas, this is not a tiki drink. (See my version of the zombie for the ultimate tiki cocktail!) 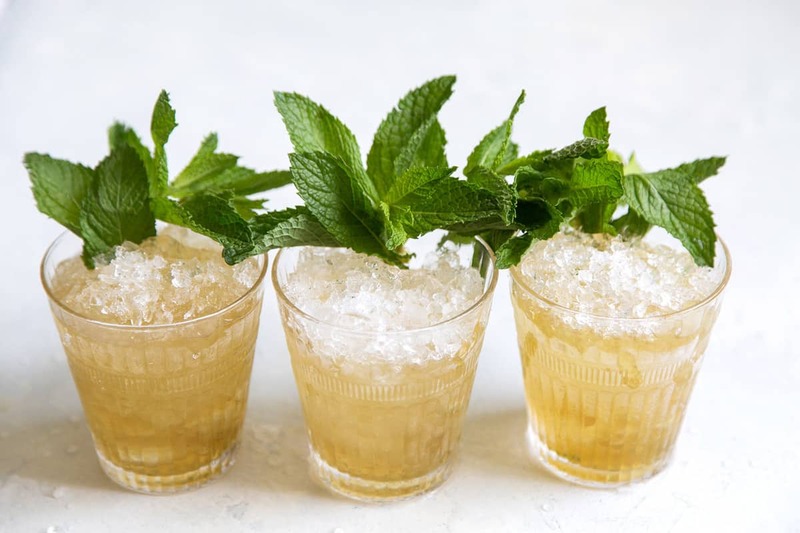 For my birthday I’m sharing one of my favorite (and easiest) cocktails: the mint julep. Traditionally this cocktail makes its grand appearance during Kentucky Derby season. Why limit it to May? 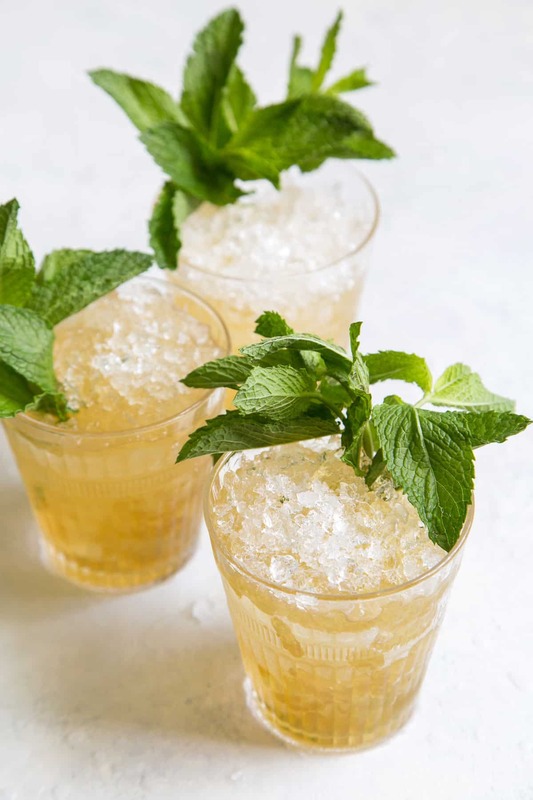 To me, the mint julep is a summer staple. What’s better than a super ice cold beverage to sip on when it’s blazing hot outside? 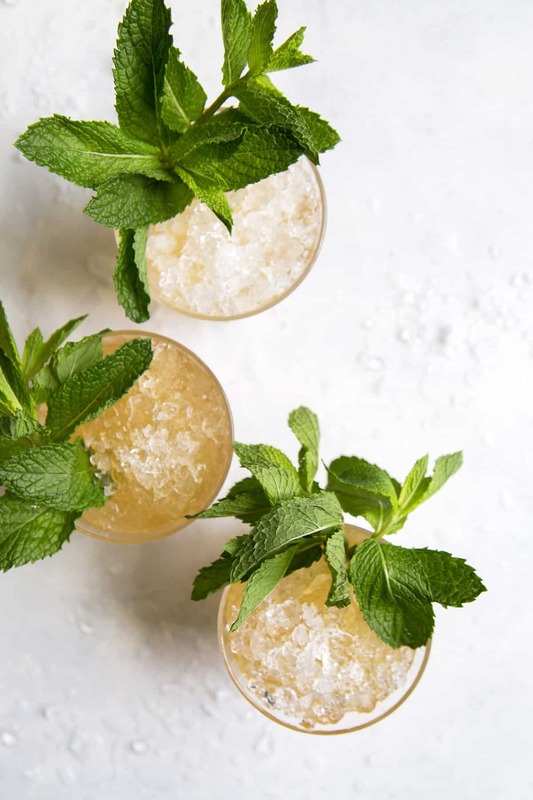 Since the mint julep is made with four ingredients (yes, the ice counts as a vital ingredient), quality of ingredients is an important factor. Use good bourbon, real sugar, ice made from filtered water, and the freshest mint you can find. You’ll need a muddler (this steel muddler is my fav. I’ve had it for five plus years and it’s still going strong. I can’t say the same for my wooden muddlers). 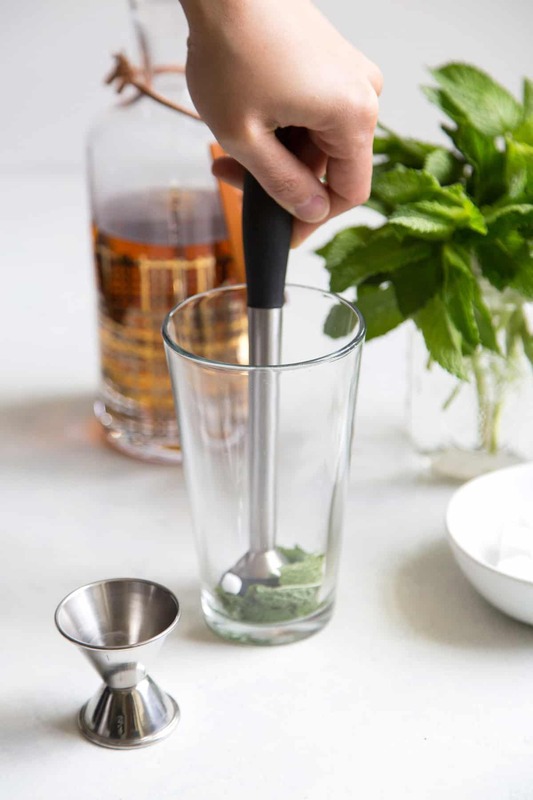 Traditionally, this julep strainer is used to strain the cocktail, but I prefer using a standard bar strainer. 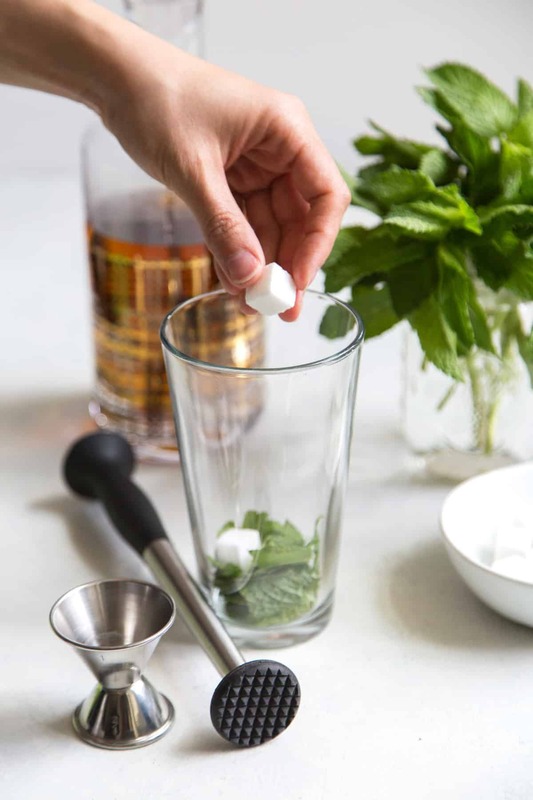 Muddle torn fresh mint with sugar cubes in a mixing glass. Pour in the bourbon and stir. Strain the mixture into a highball glass (or old-fashioned glass) filled with crushed ice. The crushed ice keeps the drink cold, but it also helps to water down the otherwise very potent mixture. A trick I learned regarding mint garnishes: slap the bundle of mint in your palms a couple times to help release some mint fragrance. You’ll want the mint to slightly tickle your nose when you drink the cocktail. This will help to enhance the minty of the cocktail even more. Cheers! 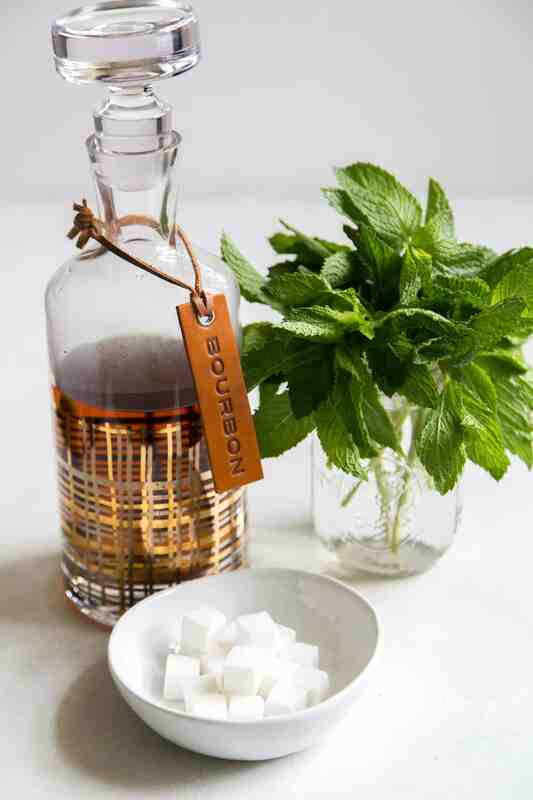 In a mixing glass, muddle together mint leaves and sugar cubes. Add bourbon. Stir to combine. Strain into a serving glass filled with crushed ice. Garnish with additional fresh mint. 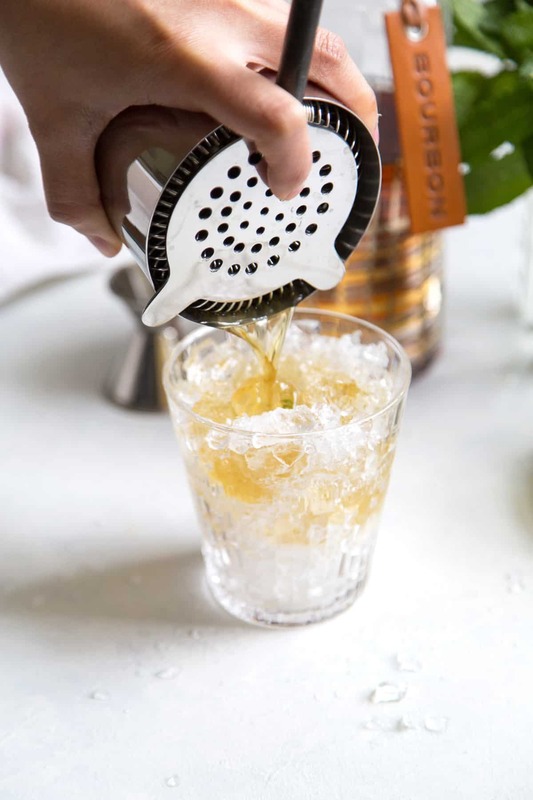 Serve cocktail in a highball or old-fashioned glass. For the traditional route, use a silver or pewter cup. This sounds so delicious! I love alcohol with mint especially when it’s got so much tradition around it! I’m totally welcoming the extra booze in my life this week. It’s only Monday, and I can already tell I’ll need it. Starting here. Love!